It was such a pleasure working on this piece -- and to be able to document a recipe that I have been enjoying my entire adult life. It was taught to me by a dear friend whose mother emigrated to America from Italy at the turn of the century -- talk about classically authentic! This recipe serves four adults, and a couple of kids. Do not double the recipe, it is better to make 2 separate batches (keeping 1 egg per batch). 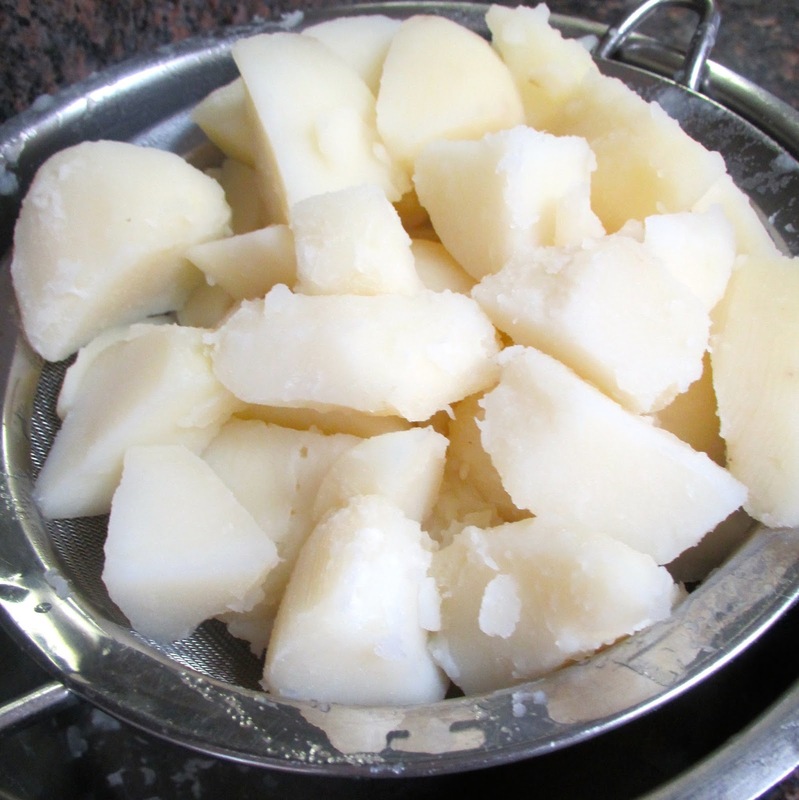 Peel, quater and boil potatoes until they are soft. Run them under cold water to bring temperature down. 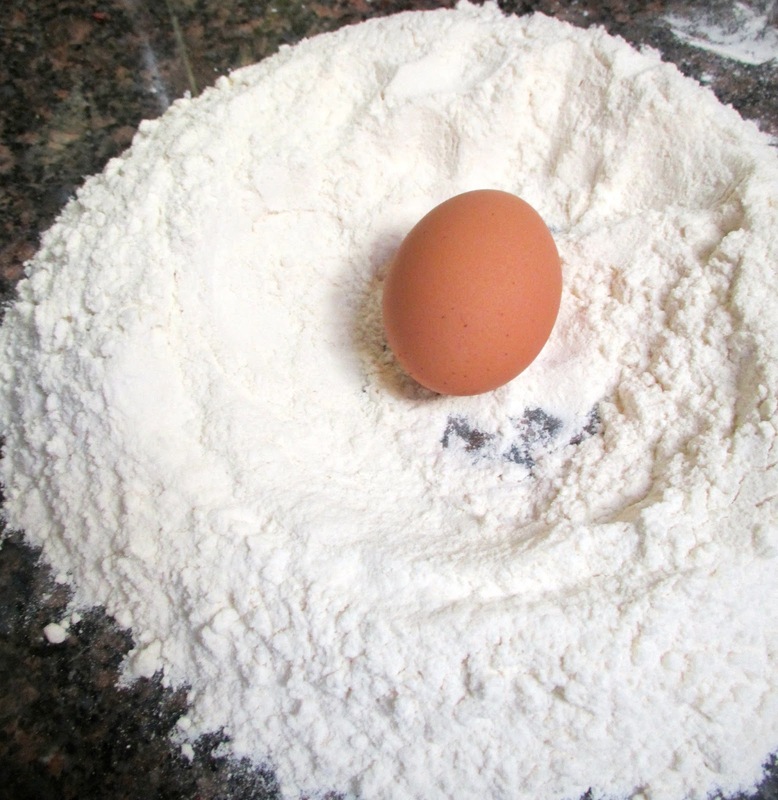 Place the flour onto a clean work surface. Make a well in the middle, add a pinch of salt. This well is very important; it will help regulate the amount of flour that is absorbed into the dough. 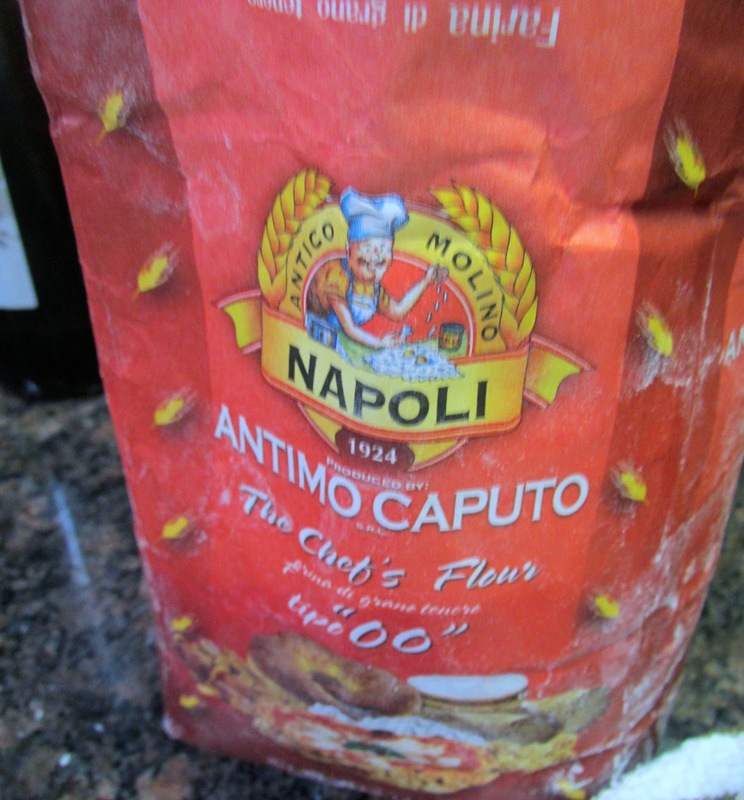 Once the moisture threshold is reached, the outlying flour is not used. 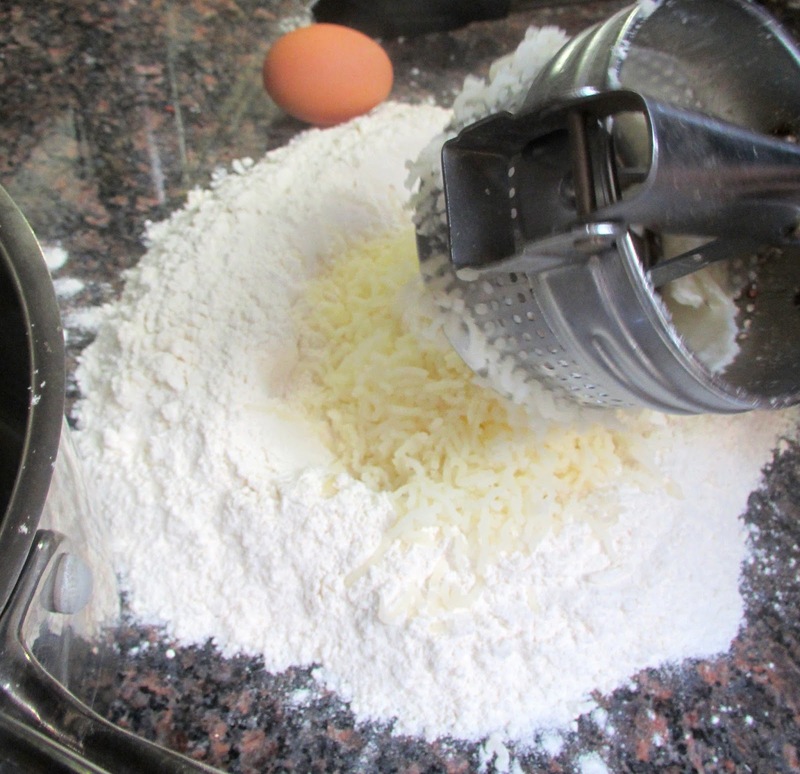 Mash the potatoes (preferably with a ricer) directly into the flour. 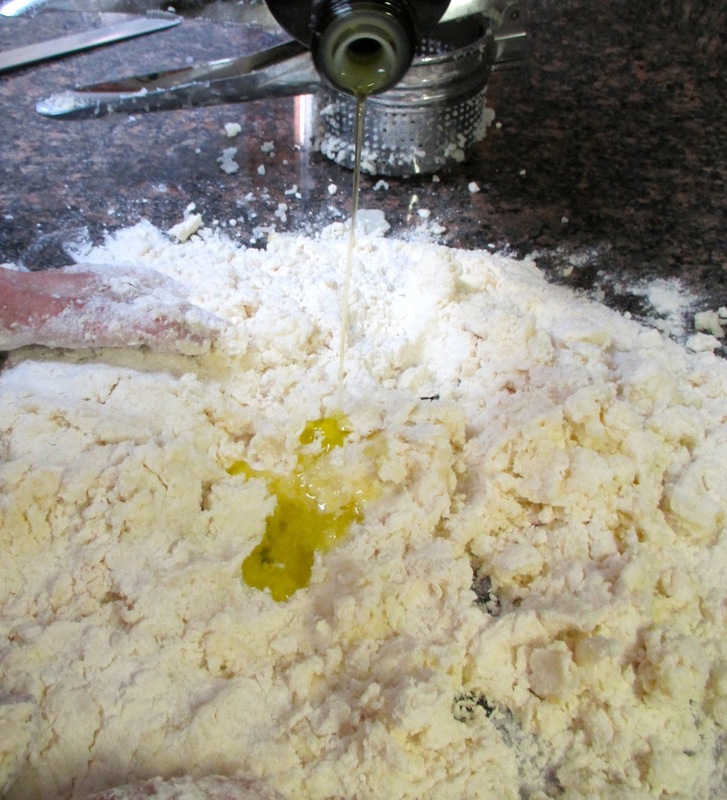 Add the egg and the olive oil and knead together with your hands. Fold flour in from the middle to the outside. It will thicken into a paste and will initially stick to your hands. It will also be somewhat lumpy. If it continues to stick to hands as you knead, add more flour. If it's too dry, add more olive oil. 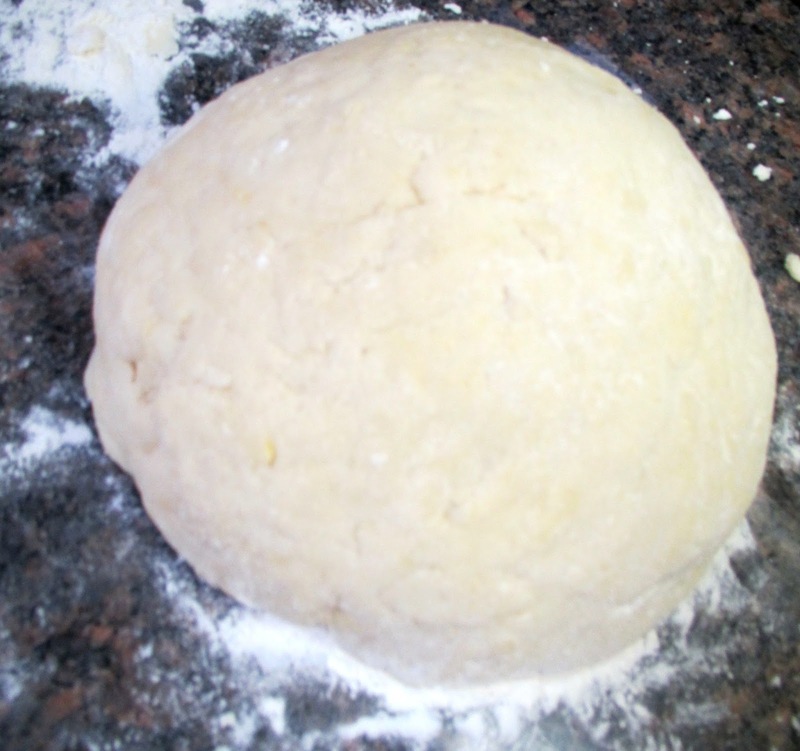 After kneading for about 2 minutes (the dough should be light to the touch and not too sticky), form the dough into a ball and let it sit (cover with a bowl) for at least a half hour. Lightly flour both the work surface and rolling pin and roll out the dough into a flat circle. 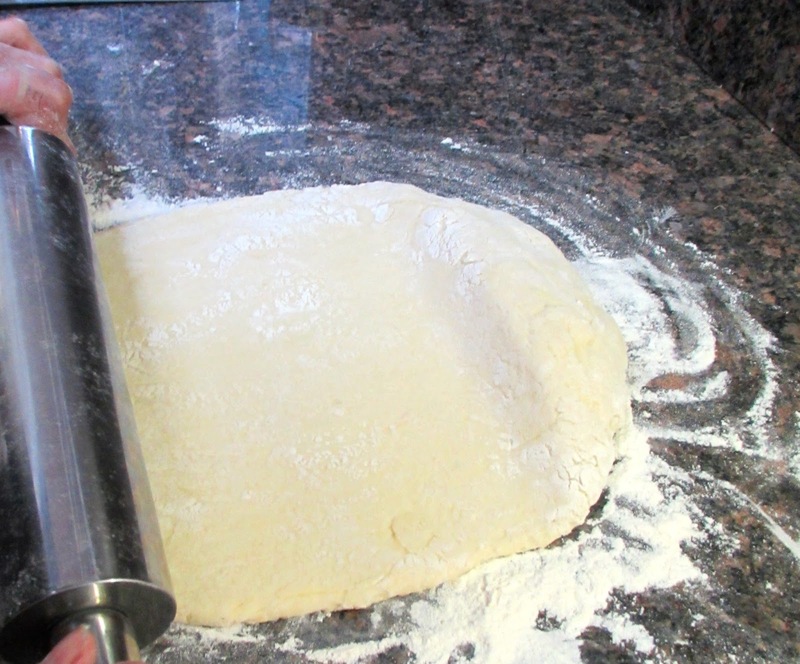 Tip: to keep the dough circular, rotate the dough a quarter turn after each roll. Roll dough until it is about an 1/8 inch thick. 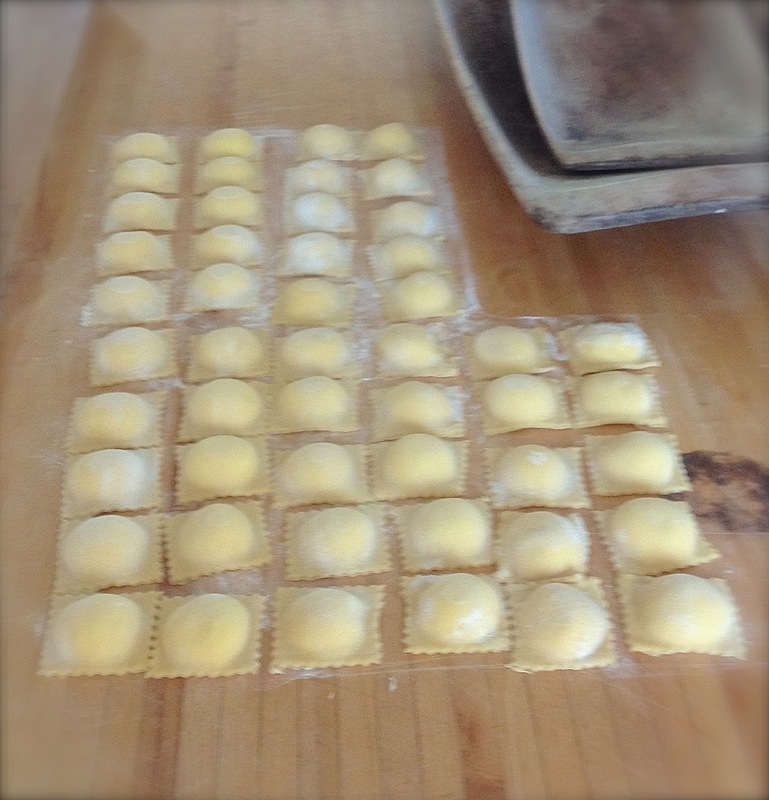 Cut the dough into even rectangles. 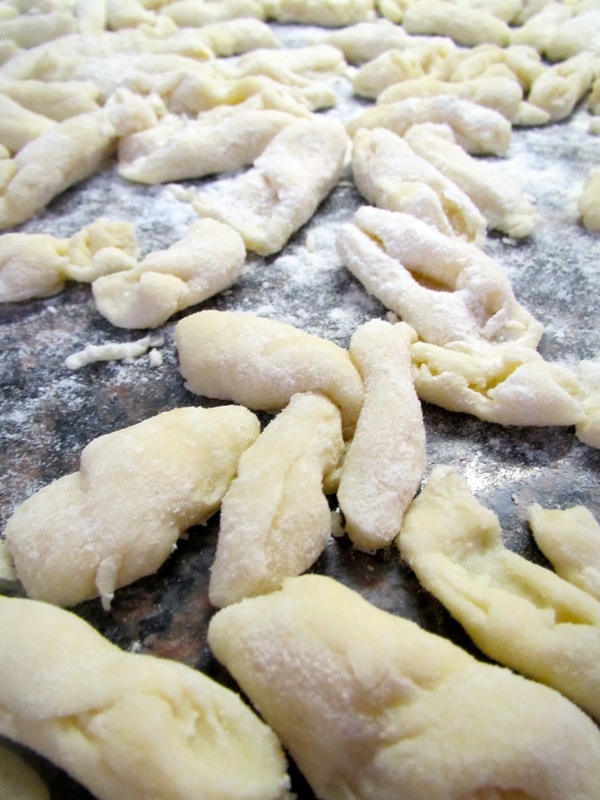 Bring a large pan of water to a fast boil, add salt and drop in the gnocchi. They will sink to the bottom. When they rise to the top, after 3-4 minutes, the gnocchi are done. In a Pinch, Just Make it Beautiful! After spending an absolutely pristine, picture-perfect Saturday at the beach, boogie boarding to soft rolling waves under clear blue skies, we enthusiastically welcomed 6 guests for dinner -- who, pleasantly and surprisingly, brought 6 more!!! Dinner parties with multiplying guests are not unusual for us, especially at our less formal house by the sea. We almost always cook in excess -- but on this occasion, we were reasonably concerned. 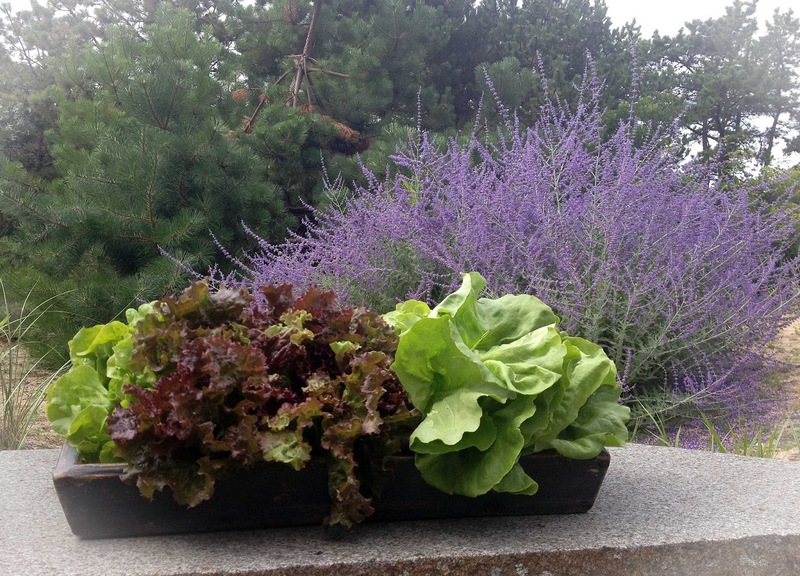 Seriously, we just get to work molding what we have into beautiful (and bountiful) food art!! 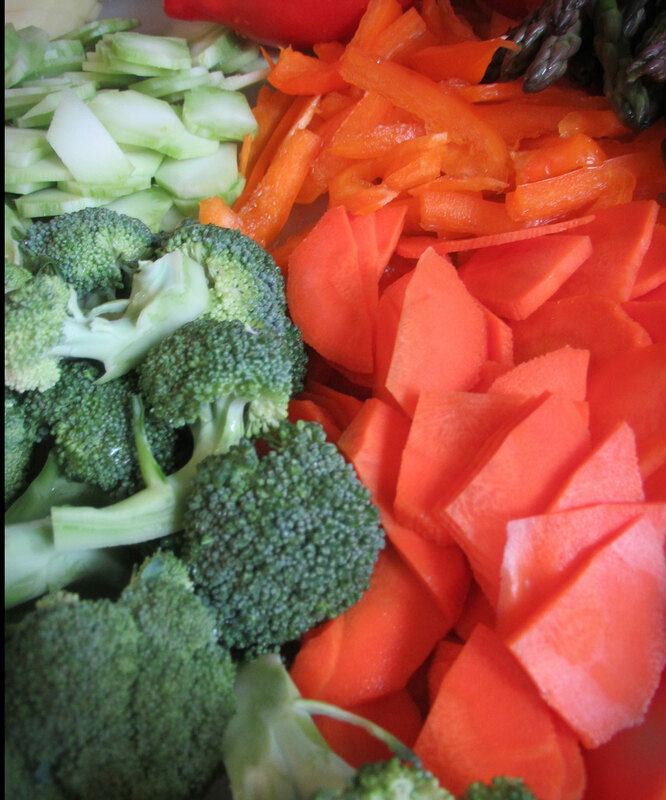 ...first, we take everything out of the refrigerator and lay it out on the counter. 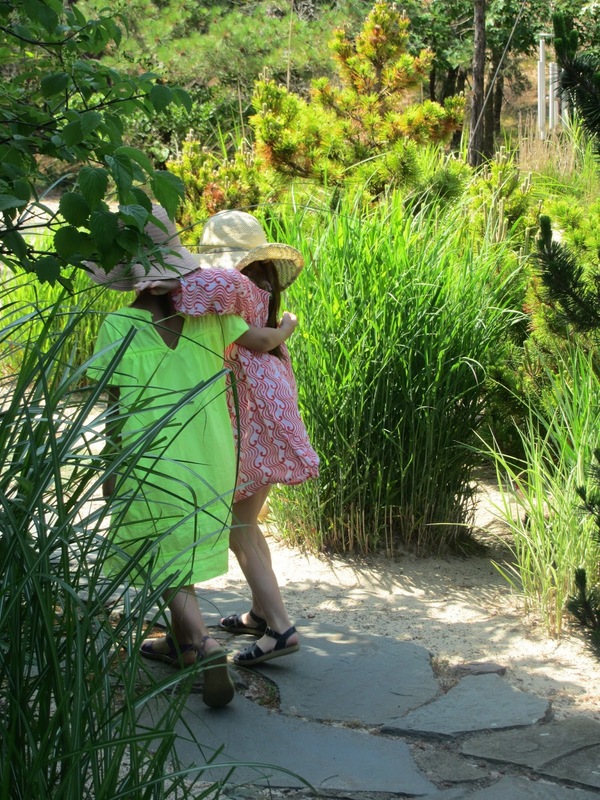 Hidden food treasures are sure to be lurking in the recesses. Crudites with a yogurt or humus dip can entertain the troops and work as a pleasing centerpiece. It's a win win. 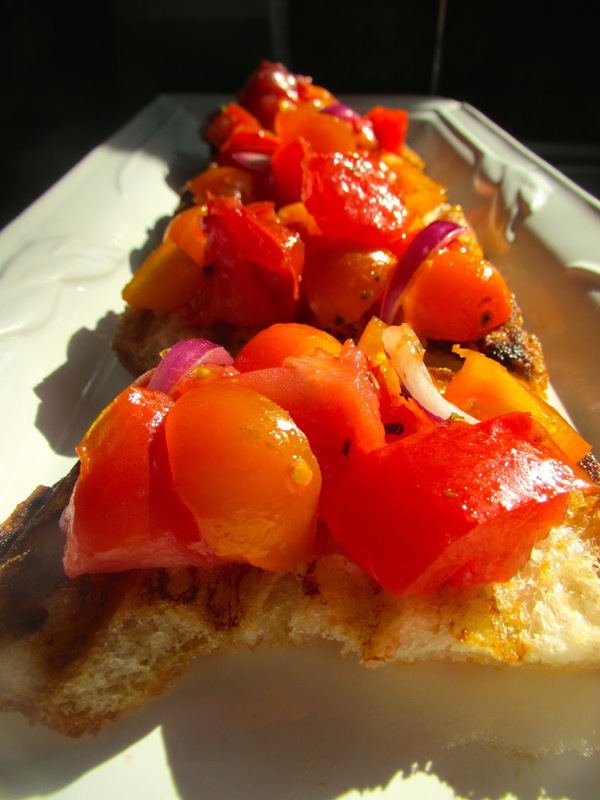 We look for items that can be quickly made into Bruschetta -- grilled bread that is drizzled with olive oil, and then a simple, fresh ingredient is spooned on top -- tomatoes, garlic, anchovy, olive paste, beans, etc. It's quick, easy, hearty and of course, pretty! I treasure my varied collection of plates aquired from all over the world. But, often the best way to present colorful food is to lay it out in simple white dishes. This encourages the food to shine. While I relish making pies with my own dough, I do not often have enough time, especially in the summer. So as soon as I arrive home with a store bought pie, I transfer it into one of my French pie ceramics. I do this by simply turning the pie up-side-down onto a plate, removing the aluminum tin, then placing the pie plate on top and turning the pie back over into the ceramic. Not only does the pie look far more appetizing, it also does not produce cringing, scrunching, metal-tearing sounds when cutting. Plus, the dough will not take on a metallic flavor when re-heating. 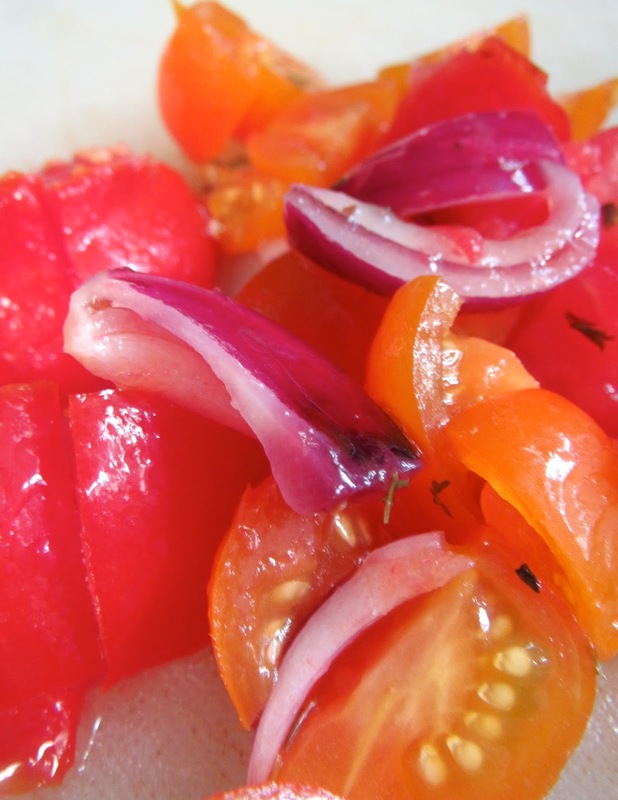 A simple wooden bowl of tomatoes looks irresistible if placed in just the right spot (and off topic -- those vibrant dried straw flowers from the farmers market will last for months). 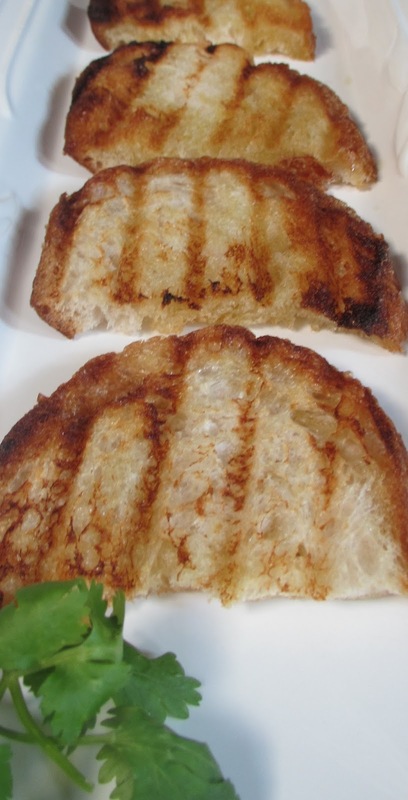 Even a simple grilled cheese sandwich can appear succulent if beautifully plated. For this dinner party, I was running low on cheese. But pairing a simple round brie with fruit (champagne grapes and strawberries) is undeniably appealing. Placing appertizer plates around the house can liven up any corner. In this case, I put the cheese plate on a large round table usually stacked with books and collectibles. Fruit makes every space look appealing. 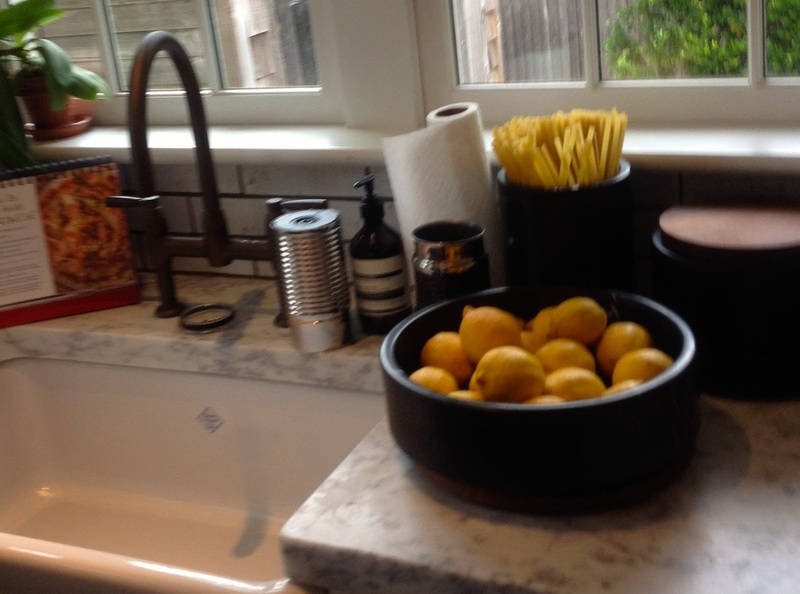 Even next to the sink, this bowl of lemons along with some dried spaghetti brightens up a fairly drab space. Don't be afraid to decorate a plate with your ingredients. 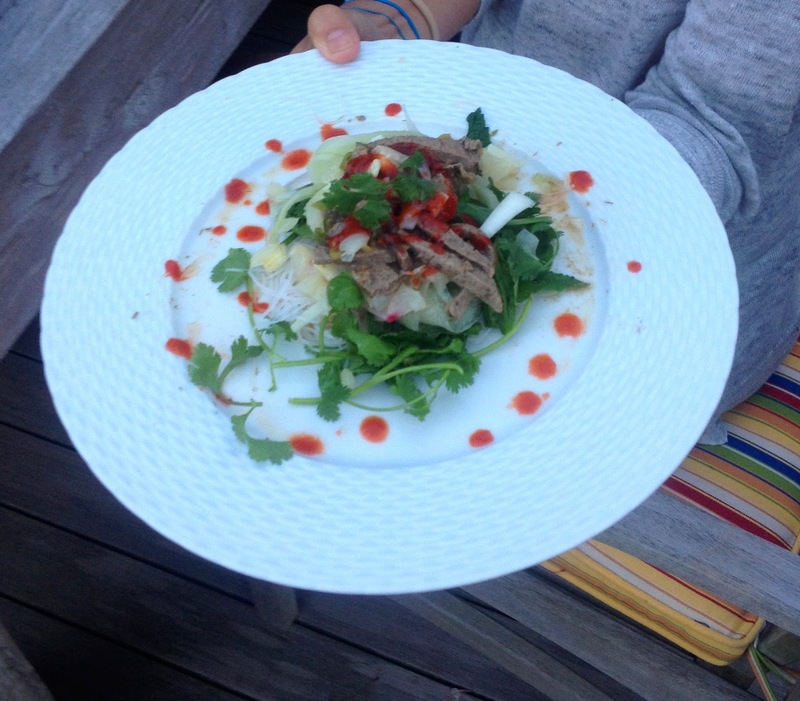 With this stacked Vietnamese dish, we simply dotted the plate with Sriracha sauce. Guests couldn't believe it! Every year, we have the privilege of hosting our now 15 year old niece here in New York. She travels from Illinois, spends a few days soaking up Manhattan (this year we took a tour of the Gossip Girl locations) and then we all travel out to the eastern Long Island seacoast to enjoy the incredible waves, shopping and an occasional celebrity sighting (it was Chris Martin from Coldplay today). Teens and tweens no longer just take pictures, they now have to help organize them in cyberspace by breaking them down into categories. Thus the hashtag (#)! By the way, Instagram is big business, it was bought by Facebook for $1 billion! 3. Twitter -- talk about short attention spans -- Twitter allows the shortest sound bite comment imaginable (150 characters or less!). But it seems everyone is in on it --we can even get twitter feeds from nationally recognized newscasters. 4. Vine -- This appears to be the next big thing -- it is ostensibly the same as Instagram but with videos. There is so much to be said about this that I published a separate post last week. 6. Sound Cloud -- Used for music, this is another version of UTube, but the music options are less mainstream. Person1: Yo, u finna go to Brandon's free tonight? I hear its gonna to be lit! Turn Up Means let's get this party started (i.e. some bottles are going to be turned upside down). Bad Usually a reference to woman, meaning she is "good." SMH Shaking my head, or -- Oh no you didn't! Feeling Ways A little upset, range of emotions. "Boyyy, this essay we just got back, its got me feeling ways right now!" Bae or Boo Cute, hot person that someone finds attractive, or can be a close friend. Tight Angry -- "got me tight." GMT Used in texts --Got me tight. Finna Can be used both negatively and positively for "trying to." Weak Fun/funny. This movie has me weak. Litt Chill, cool - Boy that party was Litt. Doe Is used instead of though. Cray or Cray Cray - Crazy, as in... why you acting so cray? 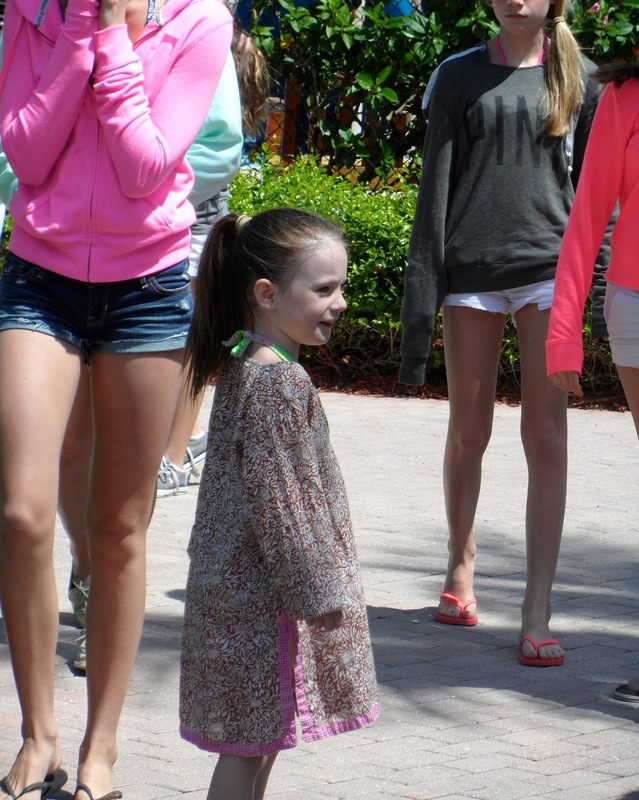 She cray cray! Work Doing something to get noticed. Always instill a sense that, even a 10 second, here-now, gone-later format can be permanent when published online, and can have long term consequences. Watch everything! Keep up with everything. If your kids are on Facebook, you should be on Facebook. Prepare the marinade by juicing lemons, limes, and grapefruit in a large bowl. Add in 3-4 cloves of finely chopped garlic, a large handful of chopped cilantro, a diced onion, a tablespoon of cumin and a tablespoon of cinnamon. Season with salt, pepper and a little hot pepper paste. Rinse the chicken and add it to the marinate. This citrus marinade works well for a few reasons. First, it tenderizes the meat and cooks it a bit. For packaged chicken, the citrus also breaks down the slippery coating on the chicken. Finally, and most importantly, it adds unbelievable flavor! Always start by cutting into the legs, where they are attached to the body. Cut through the bone of both legs and then do the same for both wings, and set them aside. Then turn chicken over (onto its back) and cut along center bone and slice out breast filets. Put the bones into the freezer and later use for preparing chicken stocks. 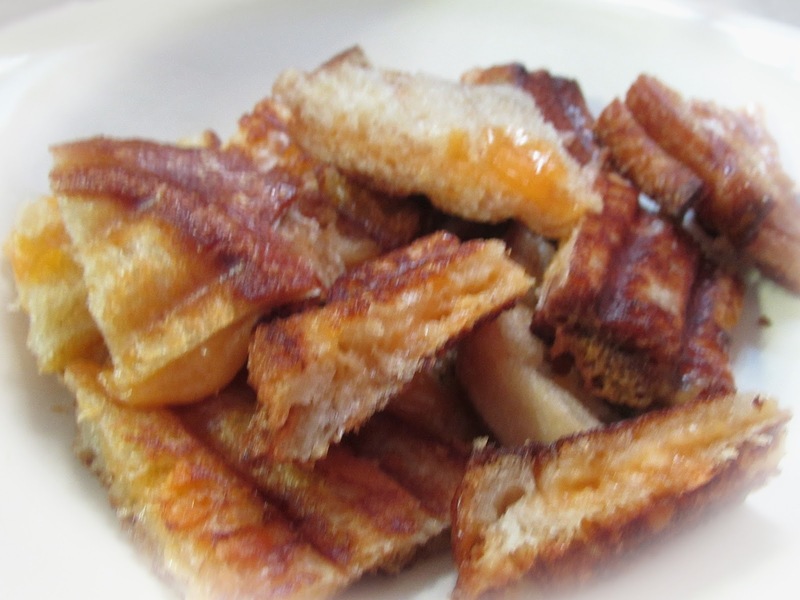 When roasting chicken, to test whether it is cooked, pierce a small hole in the thickest meat. If juices run clear, it is done. If there is still some pink, it needs a bit more time. Thermometers also work well! 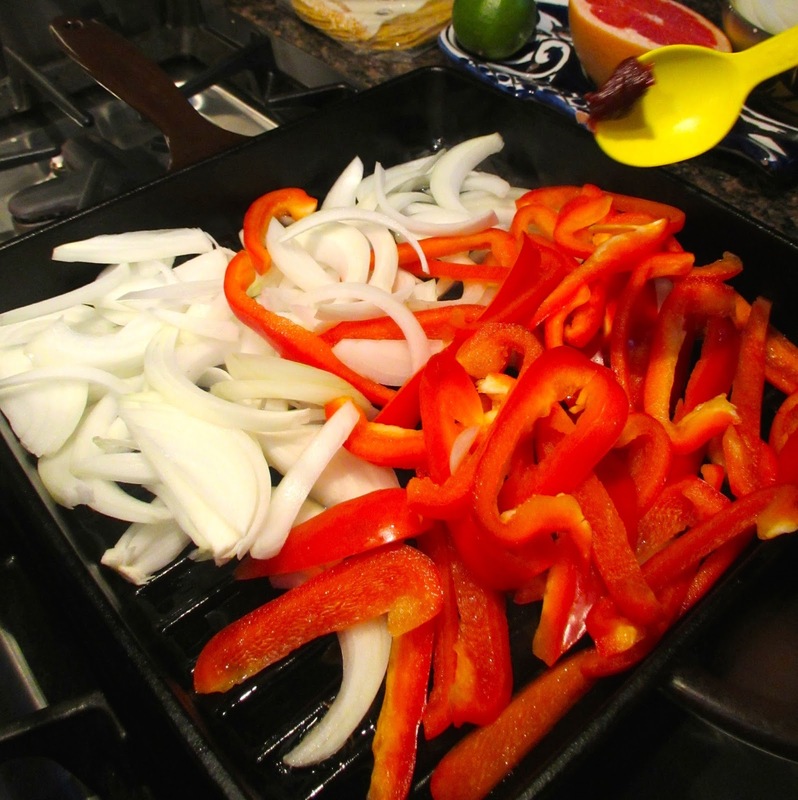 When cooking chicken and other meats, it is always best to heat the plates that guest will be using. This can be done by placing them on a rack above the stove while cooking; or into the oven for a few minutes at 200 degrees (or less). 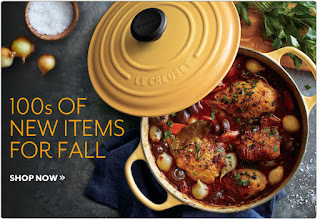 Even a slightly warmed plate will help maintain a more savory food temperature. Special thanks to my dear friend Catherine T Nguyen who helped me with the photography.